The UFC Champ just got over a nasty case of diverticulitis, no thanks to Canada. In a move sure to upset half our nation and all of theirs, Lesnar trashed universal health care and called Canada "a Third World country." In the fall, Lesnar was hunting in rural Manitoba when he became ill. He drove to the nearest facility, a small town health center (sorry, centre). But whale ivory and moose antler powder weren't doing the trick, so he fled across the border — eventually ending up in the very esteemed, very expensive Mayo Clinic. I love Canada," said Lesnar. "Some of the best people and best hunting in the world, but I wasn't in the right facility." "They couldn't do nothing for me," he added. "It was like I was in a Third World country, I just looked at my wife and she saved my life and I had to get out of there." "The only reason I'm mentioning this, I'm mentioning it to the United States of America because President Obama is looking for health care reform and I don't want it ... I'm speaking on behalf of Americans, I'm speaking on behalf of our doctors in the United States that don't want this to happen and neither do I." 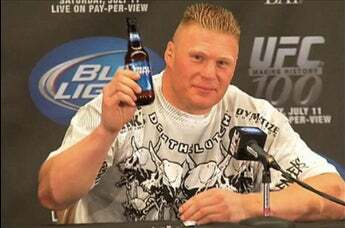 Perhaps subverting his argument, Lesnar (seen above holding a beer owned by a Belgian conglomerate) admits that while back in the States, he was misdiagnosed with mononucleosis. But not even the best in the world get it right on the first try every time.